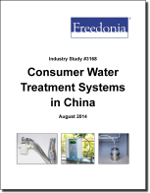 Demand for consumer water treatment systems in China will grow 17.0 percent yearly to 26.2 billion yuan in 2017. Point-of-use (POU) systems will remain the dominant product, while point-of-entry (POE) systems will grow the fastest. Membrane separation will remain the key technology.